We pride ourselves on having deep local roots in the New River Valley. Believe it or not, we’ve been serving this region for 60 years! Let’s take a look at our past to see how we got where we are today. After over 30 years in Christiansburg, Dr. Stewart was ready to retire. Dr. Scott was working with Dr. Gene Bane at his office in Salem (this is an important detail we’ll come back to), but was ready to own his own practice. Further, Drs. Becky and Scott Mann were looking to settle in this area; Dr. Becky was raised locally, and Dr. Scott is a native of Virginia. They acquired the practice in his stead. What began as a business transaction turned into a lasting friendship. For nine years, Drs. Becky & Scott nurtured and grew the Christiansburg practice. But in 1999, another opportunity for growth appeared in Salem. Remember how Dr. Scott worked in Salem? That original Salem office was owned by Dr. Tad McCullough in the 1940s and 1950s. In the 1970s, Dr Gene Bane acquired the practice and moved it from Main Street to “The Boulevard.” And when Dr. Bane retired, The Manns acquired that office as well. Around that same time, Dr. Gudeman joined the team and became one of the partners, taking over the Salem office with Dr. Scott. The exterior also got a little remodel, with three gorgeous pairs of larger-than-life glasses! They’re one of our most iconic features, and it’s all thanks to the local connections the Manns had made. “We have a patient and friend named Dave Wertz who is a metal sculptor…we brainstormed with our son Michael Mann and our close friend and VCU art professor Aaron Forrester to come up with the concept,” Dr. Scott said. “We wanted 3 iconic [eyeglass] styles to create fun interest on Main Street. The work is much about art, creativity, design and adding life to downtown, as it is about Invision.” Another art installation, The Happy Fish, followed the eyeglasses in 2017. The Salem office got some TLC as well. After renovating the Christiansburg office, the Salem office moved into a brand new building a few blocks from “The Boulevard.” “We drove people crazy trying to guess what was coming by adding the question mark sign below,” Dr. Scott laughed. 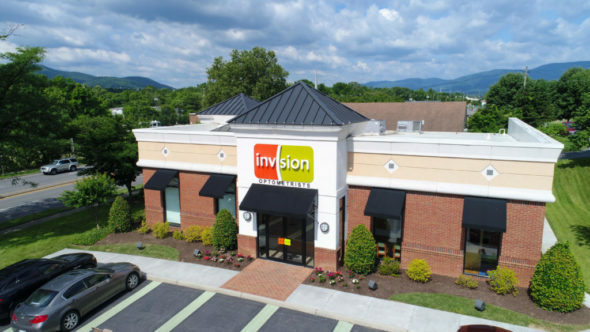 Over the past 60 years, Invision has grown tremendously, bringing the best possible eye care and fashionable eyewear to our community. Where do we go from here? To the future, of course! As we continue to grow, expand and look forward, we are grateful for our patients, staff and the people in our lives who have helped us along the way. Here’s to 60 more years of dedicated service to our region!